Bursa Malaysia Stock Watch Gadget is a standard plugin module for displaying daily stock movement of Bursa Malaysia which consists of Top Active, Top Gainers and Top Losers. Also, it gives a quick overview on how asean market performs as it provides not only Bursa Malaysia index but also Nikkei 225, Hang Seng as well as Straits Time index. If you are a Blogger or Website Publisher, and wish to publish this gadget on your website, please feel free to copy the following code, then paste it onto you Blogger or Website to show the Bursa Malaysia Stock Watch. Check Out the Steps to add the Stock Gadget to your Blog! Bursa Malaysia Portfolio Gadget is a standard plugin module for displaying your portfolio of Bursa Malaysia which contains portfolio distribution chart as well as portfolio performance chart. If you are a Blogger or Website Publisher, and wish to share your Bursa Malaysia portfolio on your website to your visitors, please follow the setup instructions below. Step 2. Add a new Public Portfolio. Step 3. Add your portfolio holding. Step 4. Configure your gadget's layout by clicking on the "Generate Script" button. Step 5. Copy the script and paste it onto you Blogger or Website. Step 1. 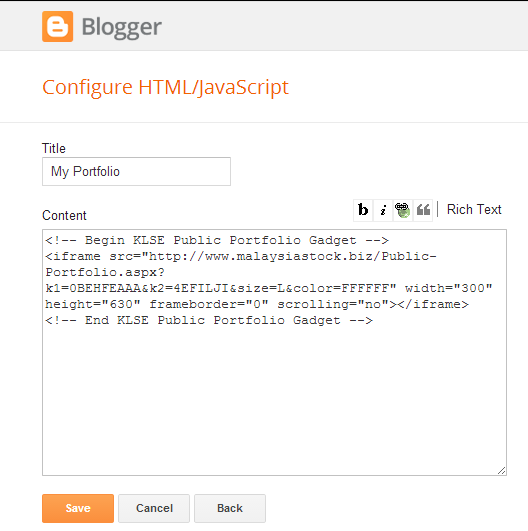 Select "Add a Gadget" from the Blogger Layout page. Step 3. Enter your Title and Paste the Script into the Content of this Gadget.